Promoting life skills through the power of cooking. 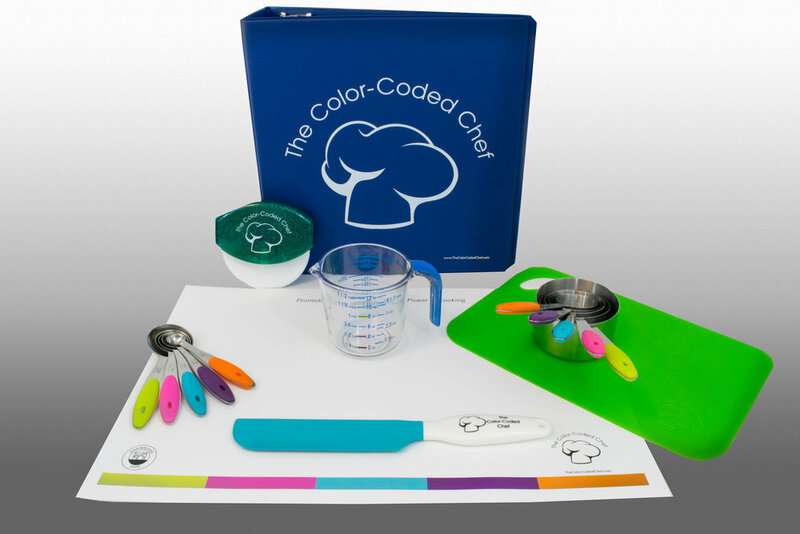 The Color-Coded Chef kit offers life skills for ALL AGES & ABILITIES through the power of cooking. We've taken a holistic approach to cooking, PUTTING it in the hands of more people, because everyone DESERVES to feel proud of the meals they can make themselves. This unique system emphasizes visual communication. The carefully designed interface removes many of the traditional barriers of cooking. This kit includes the recipes, and the utensils to make fantastic meals. Laminated recipes that use color-coded imagery to convey instructions. Check boxes on the recipes to help track each step. Durable three-ring binder to hold all your recipes. Helpful kitchen tools, such as a non-skid cutting mat, kitchen cutter and extra-long silicone spatula.